Alex Ross has a piece on The New Yorker website titled Worst College Essays 1989 in which he exhumes one of his early and less memorable literary efforts and invites other bloggers to contribute similar justly neglected masterpieces from the "dustiest corners of their hard drives". Never one to resist a challenge I dug out the literary sin of youth seen above which appeared in the October 1974 edition of Hi-Fi News and Record Review. Fortunately it dates from the time when a hard drive was the journey from London to Aldeburgh, which means there is no text file and readers are therefore spared an extract. 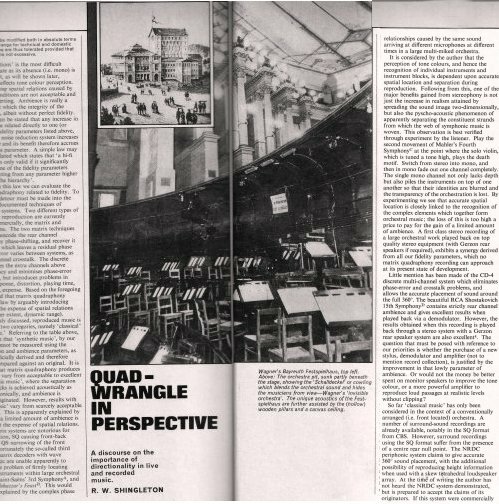 But the heading 'Quad-wrangle in perspectice - a discourse on the importance of directionality in live and recorded music' says it all. In his exquisitely turned piece Alex recounts how "Later, we rediscovered the virtue of a simple sentence". As my readers will know, I am still searching. Report broken links, missing images and errors to - overgrownpath at hotmail dot co dot uk Also on Facebook and Twitter. Henning Reinholz has gently corrected my spelling of Schalldeckel. This has prompted me to implement something I have been toying with for some time, a listing of corrections to paths. At present this is at the foot of the right-hand sidebar.